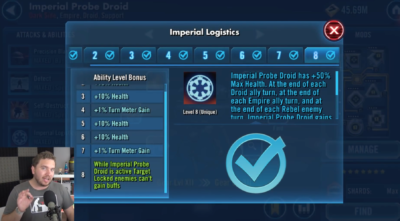 The introduction of Zeta Materials, aka “Ability Material Zeta,” has completely changed the landscape of Star Wars Galaxy of Heroes. Comprised of a combination of Mk III, Omega and Zeta Materials, these new ability “power-up” have changed the game forever. The addition of Zetas has also paved the way for new nicknames as Zader, Zaul and Zody have replaced Vader, Maul and Cody in SWGoH. In an effort to continue to become the #1 resource for all things SWGoH, Gaming-fans.com will both list and review Zeta Materials in use as we collect resources on the topic. While a busy Spring and Summer of 2018 and the addition of the Sith Triumvirate Raid has taken away some attention on this portion of the site, we are reviewing all content and rankings and looking to our fellow SWGoH GameChangers as well to ensure we bring you the most accurate information to help you in Galaxy of Heroes. We hope the info and Zeta Materials list below will help you in your next Zeta use decision and in future decisions as well. Also be sure to check out our best Zeta Abilities list for SWGoH where we use the rankings from the articles below to rank the best Zeta Materials use. Below we list the SWGoH characters who have Zeta abilities. Note any toon with a asterisk (*) has multiple Zeta abilities which will all be covered on their individual character Zeta page.